Describe how a circuit, switch, and resistive sensor work. 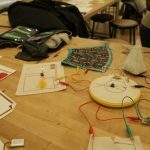 Build a basic circuit using conductive materials (copper tape, conductive thread, conductive fabric, velostat, Eeontex, and / or conductive yarn). Explore the history and relationship between activism, craft, and eTextiles. Receive an introduction to library of conductive materials and the properties of each. Different fields approach activism through different methodologies. 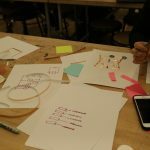 How can we amplify messages of resistance by combining approaches, techniques, tools, and materials from craft, design, and technology? What could eCraftivism be? How would you define it? Quietly demonstrate how a variety of swatches work. 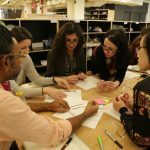 Ask participants to silently observe the materials, interactions, and techniques. Afterward, explore a particular swatch through these questions, then compare to other swatches. 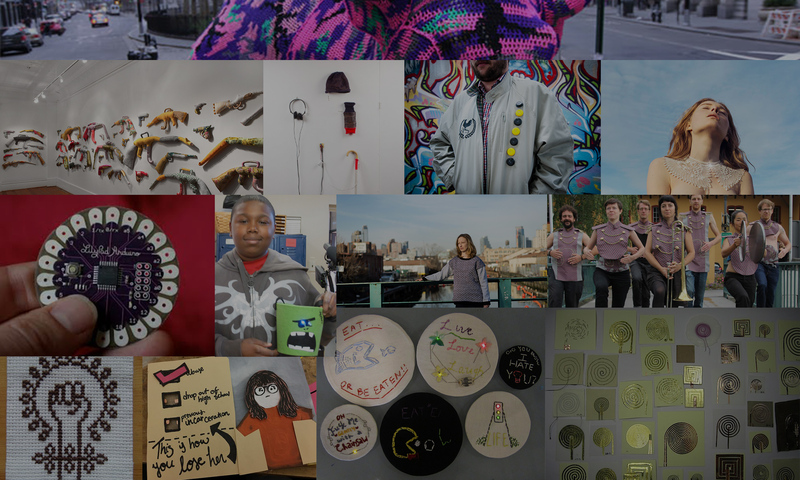 Review examples from (1) craft history through an activist lens, (2) the emergence of eCraft and eTextiles, and (3) current projects related to the theme. 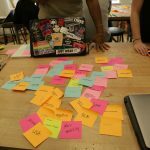 In small groups, cluster the post-its into related groupings. Give each category a name. How does a circuit work? How does electricity flow through it? What are the different conductive materials available to you? Why are connections important? What are different ways to create strong connections? Principle: Radical self-expression. What do you want to say? 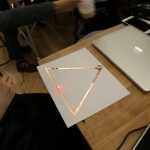 Use the techniques you have learned to craft a paper or fabric circuit with a switch or sensor that conveys a meaningful message.